The former Taoiseach passed away yesterday aged 97. 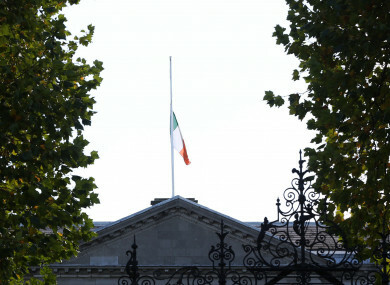 Tricolour lowered to half mast at Leinster House today. FORMER TAOISEACH LIAM Cosgrave is to be given a limited State funeral as per his family’s wishes. The 97-year-old passed away yesterday after battling ill-health for a number of months. In recent years, former taoisigh Garrett FitzGerald and Albert Reynolds both received full State funerals following their deaths in 2011 and 2014 respectively. However, it’s understood there will be a limited State funeral which will involve a smaller, pared back service, which is more family orientated. Cosgrave’s removal is scheduled for Saturday to the Church of the Annunciation in Rathfarnham for funeral mass at noon. He will be buried in Goldenbridge Cemetery, Inchicore. The family has requested that no flowers be sent. Tricolours flew at half mast across the country today out of respect for Cosgrave. Taoiseach Leo Varadkar signed the book of condolence for Cosgrave this afternoon in Dublin following his passing late last night. The book was opened in Cosgrave’s heartland of Dun Laoghaire, at the County Hall on Marine Road in the south Dublin locality at 11am today. Speaking in the Dáil this lunchtime, Varadkar described Cosgrave as “courageous”, “determined” and a “man of great loyalty and kindness”. Cosgrave is survived by his three children Liam, Mary and Ciaran. Email “Liam Cosgrave to be given a 'limited State funeral' as per his family's wishes”. Feedback on “Liam Cosgrave to be given a 'limited State funeral' as per his family's wishes”.